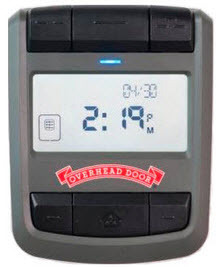 ​​​​​​​​​​​​​​​​​​​​​​The Overhead Door® Advanced Wall Console has been designed to not only provide homeowners with advanced security, but to deliver more control over their garage door opener, its lighting and opener performance status. The console is programmable to provide service reminders and contact information for the local Overhead Door™ Distributor, making annual maintenance easy and convenient. ​The Advanced Wall Console provides homeowners with greater control of door operation, garage lighting and security for peace of mind. It has Sure-Lock™ security control built in, which allows homeowners to lock external activation of their garage door openers any time of day or night, making it ideal for when homeowners are away on vacation and business travel. 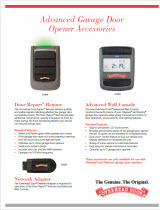 Provides performance status of the garage door opener; the last 10 cycles can be reviewed for troubleshooting.